During the booking process universal-rent-a-car.com may ask for personal information such as your name, home address, telephone number or e-mail address. This information is used to process your booking and to contact if we have any questions regarding your request and to also send you an electronic confirmation in the form of a voucher. If you are already a member we associate collected information with membership information stored in our customer database in order to speed up the booking process and to apply any applicable discounts. 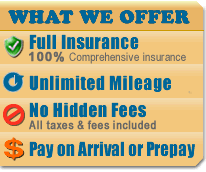 We use personal information provided via this website to administer and manage our car rental business efficiently. As universal-rent-a-car.com is an international company managing a network of affiliated car rental companies and partners located both inside and outside Europe, we may share with these companies information which specifically relates to your order and is necessary for completing the rental process. This information may include your name and/or telephone number and is used solely for the purpose of providing you the rental vehicle at your destination. We do not share information collected via this website with any parties outside the universal-rent-a-car.com network or for any other advertising purposes without your permission. We never make your e-mail address available to any other company or organization outside the universal-rent-a-car.com network. If you supply us with your postal address, you may receive periodic mailings of news from universal-rent-a-car.com. If you do not wish to receive such mailings, please let us know by calling or writing to us. What data does universal-rent-a-car.com collect? We collect your IP address when you visit our site. This only identifies your country of origin and does not contain any information about you as an individual. We use this information to help us understand more about where our site traffic originates. When you visit our website we collect information using Cookies. Cookies are a small file that a website server stores on your computer. Cookies enable our website to recognise your computer and to remember your entries (such as dates, cities, etc) as you move from page to page, or when you visit the site at a later date using the same computer. If you have any questions or concerns regarding the privacy of your personal information please feel free to contact us.